The son of an Irish Coast Guard volunteer from Co Clare is exhibiting his innovative lifejacket design at this year’s BT Young Scientist and Technology Exhibition at the RDS in Dublin. As TheJournal.ie reports, 16-year-old Dylan Egan has been working on a new system for an automatically inflating vest that won’t react to splashes of water. Egan’s design would also allow more experienced seafarers such as rescue personnel to toggle the auto-inflate function to make it more convenient when working at sea. The BT Young Scientist and Technology Exhibition continues till tomorrow, Saturday 12 January. #WaterSafety - Lifejackets should be made compulsory on Northern Ireland’s waterways, the inquest into the drowning of a former Lough Erne Yacht Club commodore has heard. As BBC News reports, coroner Joe McCrisken suggested that Michael Beattie may have had a better chance of survival if he had been wearing a personal flotation device. Beattie, whose body was found in the lough on 12 December last year, is thought to have slipped into the water in icy conditions while attempting to board his luxury motor cruiser the night before. CCTV footage showed him struggling in the water for almost two hours hours before swimming to land, apparently in a confused state, and falling back into the water 90 minutes later. The inquest found Beattie died from drowning as a result of cold water immersion and hypothermia. “County Fermanagh has some of the most tranquil and beautiful waterways in the world, but water has inherent dangers,” McCrisken said. #WaterSafety - Alistair Rumball of the Irish National Sailing Club shares a story from a friend that serves as a timely reminder of the importance of keeping vigilant whenever on or near the water. 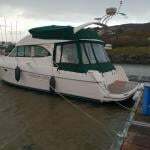 Alistair’s friend was mooring his Jeanneau Sun Odyssey 35 for the night at Conwy Quays in North Wales when tiredness got the better of him as he manoeuvred the boat into the narrow berth available. 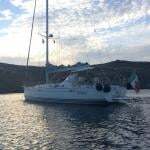 Forgetting the dinghy tied to his stern, he allowed the smaller vessel to wedge between his starboard and the pontoon, with the port bow leaning against the fender of the neighbouring boat. “Having untied the line I somehow decided to head back on to the pontoon in order to manoeuvre the dinghy out of the way, but in my haste I attempted to step straight from the transom to the pontoon. It didn’t work," he writes. Luckily for Alistair’s friend, his lifejacket sprang into action, and he was only underwater “for perhaps a split second” before the device fully inflated. Hauling himself out of the water was a different matter, however, as his choice of boots — now flooded with marina water — instead of deck shoes made the move exceedingly difficult. The INSC website has more on the story HERE. #WaterSafety - Finding a lifejacket for your child isn’t hard — but it is vital to choose the right jacket with the right features, as CH Marine’s new handy buying guide explains. Lifejackets are now designed even for infants as young as a few months. Paying attention to comfort, fit, colour and style will encourage your child to enjoy wearing their lifejacket — as well as keep them safe and supported should they enter the water. CH Marine’s lifejacket buying guide is available as a PDF to read or download HERE. #WaterSafety - Irish Water Safety, the Irish Coast Guard and RNLI have issued a joint appeal reminding the public to stay alert to the risk of drowning at all times and especially in the current hot weather. On average, five people drown in Ireland every fortnight — and the risks increase during July and August, the most popular months for swimming and other water-based activities. Swim within your depth and stay within your depth. Never swim alone. Wear a lifejacket or personal floatation device when on or near the water and make sure that it has a correctly fitting crotch strap. This applies when boating but equally to both experienced and once-off casual anglers fishing from shore. Supervise children closely and never use inflatable toys in open water. The recent multiple rescue off Fethard is testament to the dangers of using inflatables where a sudden current can put lives under threat. Swim at lifeguarded waterways listed by Irish Water Safety, or in areas that are known locally as safe and where there are ring buoys present to conduct a safe rescue. Throw a ring buoy or any floating object, call 112 and ask for the coastguard. Waterways Ireland is also running a campaign with Irish Water Safety to encourage the wearing of lifejackets and personal flotation devices on the Shannon Navigation during the 2018 summer boating season. The awareness campaign will aim to emphasise the importance of wearing lifejackets at key focal points along the Shannon. You may notice some new signage which will be erected at key locations – locks and marinas — encouraging water safety. Information leaflets will also be distributed to water users at these key locations on the water. Waterways Ireland encourages the safe use of its waterways by all. The wearing of lifejackets and personal flotation devices is not only an effective way of enhancing water safety, it is also a legal requirement on all pleasure craft in Ireland.